Investors Take Note! Time to Look at All Banking Stocks in 2nd Half of 2018! If some of you keep track of Banking Stocks all over the world, you probably will have notice that Banking stocks have not been performing well ever since January! US banking stocks like JP Morgan has dropped from US$119 to around US$100. Citigroup has dropped from US$80 to US$64. European Banks like ING group has dropped from US$20 to around US$14. Deutsche Bank has dropped from US$20 to US$10! Even Singapore Banks like OCBC has dropped from S$14 to S$11 in just 2 months. UOB has dropped from S$30 to S$26 in 2 months. So have the Banks lost its luster?! **** In fact to know whether the banks will be doing well, all you need to do is study the Earnings announcement of US Bank Earnings. Last week, a lot of US Banks declared tremendous earnings that beat Earnings Estimates! This is a show of Great strength and Comeback! It is time to take note of Banking Stock again 2nd Half of 2018!! Out of all the Banking Stocks, I like European Banks the MOST! Reason being it drop the most over the last 6 months. Tomorrow Deutsche Bank (Symbol: DB) will issue its Earnings. I am looking to see if this Germany Bank is making a comeback. If it is, I will be poised on invest some European Banks like ING Group (Symbol: ING) - My favorite Banking stock in Europe. Congratulations if you follow our call on US stock Coherent - Making US$10,780 profit, 40% return in 1 month!! Did you follow our last call on Coherent, a US stock I am aiming to bottom exactly at US$150. This stock has dropped from US$329 in January to US$150 recently! 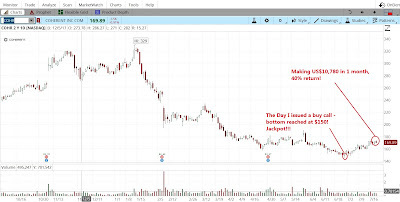 Check out on our last article tip on this stock when it was at $152, when we issued a buying call on 27th June 2018. Today the stock price has risen to US$170, where our first target of US$167-$170 is reached. with a Total capital of US$27,720. Total profit is US$10,780, 40% return in 1 month! 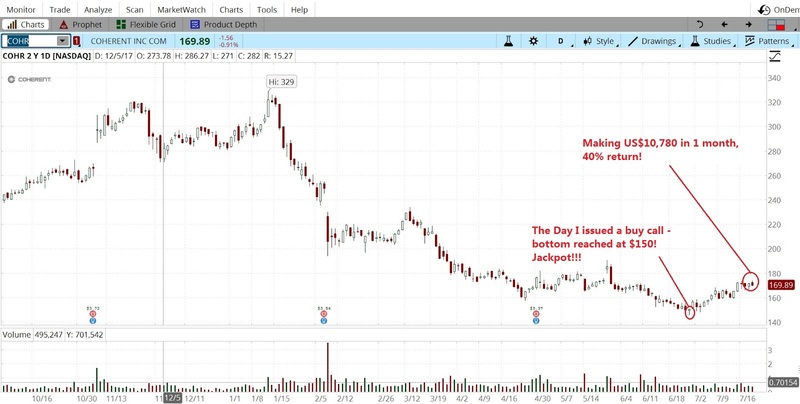 This is the beauty of learning how to trade! I always believe TRADING is a skillset that can create a Bonus income for you every month, all you need is have the correct Skillset and Method! Wallstreet is just using "Trade War" as an Excuse for the Fall! Last night Dow Jones fell 165 points to close at 24,117. In the last 2 weeks, US stocks fell nearly 1400 points. The trend is relatively weak.The biggest culprit seems to be "trade war". Two weeks ago, Trump implemented the tariffs on $50m worth of China Imported Goods In fact, please note that this is nothing new. As early as 3 months ago, Trump already announced plans to implement the tax tariffs,.The stock market has already tumbled hard because of this trade war issue. The only difference is that Trump starts the implementation only two weeks ago. My opinion is that this US stock market drop is not really because of Trade War. The biggest reason is because it has risen too much ! Just two weeks ago, many US stocks have hit a new high. Example: two weeks ago, Apple's stock price rose to $194 all-time high price. Now it falls back to $184 . Two weeks ago, Microsoft's share price rose to $102 historical high price. Now it falls to $97 . In fact, the biggest reason of the drop is because a lot of US stocks have hit record high price. This pullback is normal! It just happens there is this Trade War news that happened. It became an excuse for the market correction. The volatility in recent days aren't as high as that in March this year. If you remember in March the market reacted violently to the trade war fears. More so than now. At that time, DOW can easily drop 400 to 500 points in one single trading session. More importantly after the drop in March, many technology stocks still climbed to record high price two months later. This is resilience. My view is that the US stock market is still quite healthy. After a while, everyone will forget this theme about trade war again. Do not miss this chance to invest! 1) US companies will start to report 2nd quarter earnings next month - When many companies report earnings, Wall Street focus will slowly shift from the international political scene to companies earnings. This trade war news will soon be forgotten. 2) US companies earnings this year will be fantastic - This is because of the US tax cut policy. US companies earnings growth this year is projected to increase 30-40% because of the tax cuts. Many US companies earnings reports will be excellent. I wouldn't worry too much about the upcoming 2nd quarter earnings. Please remember that when we invest in stocks, the most important word is "EARNINGS". Other news such as trade war are merely noise. Do not be distracted! 3) US economic data is very healthy - The unemployment rate in June has dropped to 3.7% . This is the lowest unemployment rate in the last 20 years. That shows that the job market is very vibrant. Data on manufacturing report also shows better numbers than expected. 4) Looking at charts, Dow Jones has found a very strong support at the 200day Moving Average - Whenever DOW drop to the 200 -day moving average, chances of a rebound is always high. Please remember that in investment, we should always buy low and sell high. If stocks run everyday, i will be worried of investing. But if stocks drop, I will be looking to invest. This correction recently provide us with this chance to BUY! Today STI is 3262, up by around 6 points. I think this is a very good chance. When STI was high at 3600 , I still worried about the drop, Tpday it has dropped to 3262, giving us a 10% discount. This is a GIFT! My opinion remains the same. I think STI at 3300-3350 is a bargain and support. Now at 3262 , it has gotten cheaper than what I imagined. If you still worry about trade war. my suggestion is you can invest a little to test the water first. If the stock market rose back to 3300 or more points, start accumulating. If it continues to fall, then don't bother to invest. Testing the water is sometimes important in investing. Of course, Singapore 3 big bank stocks have fallen with STI ever since the drop from 3600. Watch the Banking stocks. The banks afterall will definitely benefit from the rise in interest rates this year. Another sector I will look at is that oil and gas sector. Oil stocks have fallen quite a bit over the last few months. However do not forget that oil today is back above $ 70. If oil price can maintain at $ 70 or more, oil and gas stocks will certainly benefit. Shanghai Composite Index dropped a lo because of a trade war. It is the weakest Asia index. Today it is 2816 points. I think it is a chance to find some good China blue chips stocks. When the index rebound, these blue chip counters will rebound strongly.